Christmas for me is mostly about food, family, old traditions, and making new ones. For most of my life, we celebrated with a big family Christmas at my parents' house. 27 years worth, to be exact (minus my first when we lived elsewhere, the time my grandpa had surgery (he's okay, don't worry), and last year when I was too pregnant to fly home)! Even as an adult when I had my own house and even after I was married, I would stay the night at my childhood home in order to wake up on Christmas morning with everyone. For all of the joy, memories, and especially the food, we mostly have my mother to thank. For those 27 years, she shopped to feed a crowd, meal-prepped and planned for days, and cooked countless meals during the entire holiday celebration. There were always at least 9 of us in the house, but usually more and once over 30, when all my family from Hawaii flew in. We would all try to help here and there, but really it was my mom that made Christmas happen. Did I mention she is an amazing cook too? Until I was much older, I really only thought of the dinner we would have on Christmas night - always with the honey-baked ham, spinach salad, and scalloped potatoes. It took me some time to see all the behind-the-scenes work she put into not just that memorial meal, but the breakfast we would have the following day before my aunt and uncle drove back home, the Christmas Eve dinner we would all enjoy after coming home from Mass, and everything in between. The Christmas the year that Brett and I were engaged, we decided to start a new tradition to help mom out - we would be in charge of Christmas Eve dinner. Each year, I enjoy the task of coming up with a new dish to serve the family (I don't cook much for large crowds, so this has always been somewhat of a challenge and learning experience) including the time we made fresh pasta (everyone ate at different times that year since we couldn't roll it fast enough and didn't think to make it ahead to dry), the individual beef wellingtons (this was actually a huge success somehow! ), and the time I thought it would be clever to make a variety of pot pies (I think I got the idea from an old Martha Stewart magazine). A croquembouche is a tower of cream puff held together with caramel and decorated with spun sugar. Gravity-defying tower + boiling sugar? Yup, I had gone mad. Nevertheless, I tried to pull it off - I didn't, but I sure tried. I remember trying to assemble the whole thing while Brett and my cousin watched a Lost marathon in the living room - them being captivated by all the happenings on the island, me trying to balance a pile of irregular-shaped puffs and spinning sugar around the kitchen like a wizard with a whisk instead of a wand. I needed to make the food in advanced since we were supposed to eat after church. I didn't think this through when coming the pasty cream and sugar elements. I ended up popping the whole thing in the refrigerator to keep the cream chilled, but all of the sugar ended up melting. Good bye tower! Did I ruin Christmas? No. Will I attempt to make a croquembouche again some day? You betcha! I've teamed up with Egg Farmers of Canada to make sure that we don't get defeated by our #ScrambledPlans and get back in the kitchen even after disaster strikes. If anything, you will be humbled by the experience, no? So for this year, I made Christmas Cream Puffs with cranberry and raspberry compete - aka my "Redemption Puffs." And while they are not stacked sky-high into one mind-blowing tower of confections, the piped pastry cream and simple berry on top do resemble little towers of second-chances. 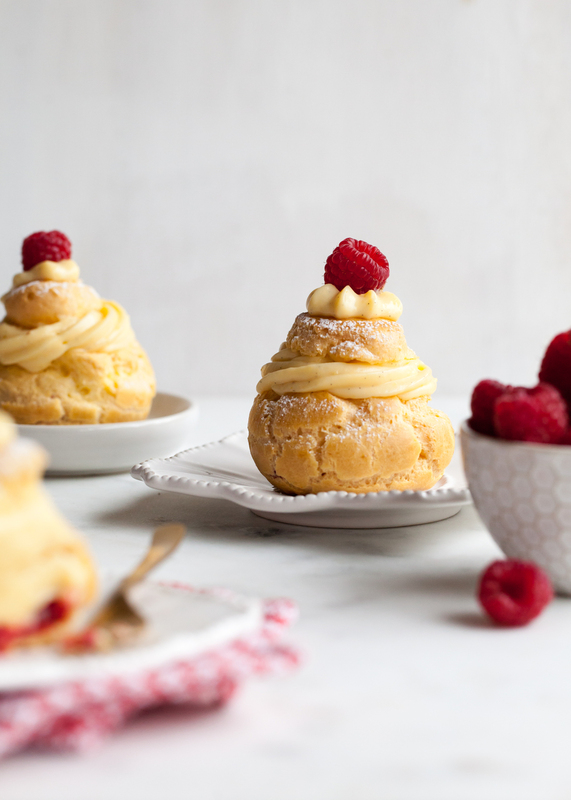 I am such a sucker for any custard-related dessert, so naturally I think these puffs are heavenly. The cream puffs are filled with real-deal pastry cream (not just whipped cream), specked with traces of real vanilla bean seeds throughout. The pastry cream is so silky and smooth - I could probably eat it with just a spoon (again that is, since I already did - hehe). To off-set the richness, I added a small layer of sweetened cranberry-raspberry compote. I simply modified my regular go-to cranberry sauce, tossed in some fresh, whole raspberries, and placed a large dollop in each pate a choux shell before piping in the pastry cream. 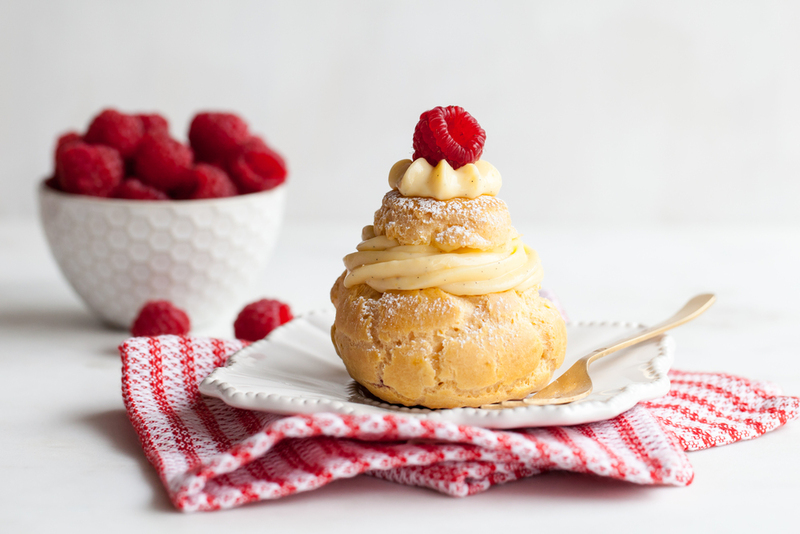 The red berries not only add a touch of tartness for balance but make these Christmas Cream Puffs ultra festive. 1. Pre-heat oven to 400 degrees. Line baking sheets with parchment and set aside. 2. Place the butter, water, and salt in a medium saucepan, Over medium heat, melt the butter and bring to a boil. 3. Remove from the heat and stir in all of the flour with a wooden spoon until completely mixed in - taking care to mix in any flour stuck in the corners. It will resemble mashed potatoes at this point. 4. Return the saucepan to the heat and cook the flour. Continue to stir for about 3 to 5 minutes, or until all of the dough pulls from the sides of that pan and forms a ball in the center. 5. Transfer the dough to the bowl of an electric mixer. With the paddle attachment, cool the dough by mixing it on low to until it is just warm to the touch. 6. Begin adding the eggs, one at a time. Be sure that each egg is thoroughly mixed in before adding in the next. You may only need 4 eggs, so be careful not to go too quickly. Or even 4.5! 7. Continue mixing and adding in the eggs until the batter forms a "V" when pulled up out of the bowl with a spatula. Similarly, if you lift the paddle attachment, a tongue of batter should form on the end. The dough (or batter) should soft but not runny. It should be pipe-able, but still be able to hold it shape. Not sure if you added enough eggs? Try piping a small amount! 8. Place the batter in a large piping bag and chill in the refrigerator for about 15 minutes. 9. Snip the end off of the piping bag and pipe large mounds of batter - about 2-inches in diameter (if using a reusable canvas bag, fit it with a plain round tip). 10. Use a slightly dampened pastry brush or clean finger to gently press down any peaks that may form. 11. Bake for about 15 minutes, or until the choux paste "puffs"
13. Turn the oven off and crack the door. Allow the puffs to continue to dry out in the oven for another 15 minutes or so. Note: Unsure if your puffs have cooked long enough? Crack one open! The inside should be airy and dry - not at all doughy or eggy. They should feel light and hollow. 3. Meanwhile, whisk together the sugar, yolks, and cornstarch. 6. While stirring constantly, bring the mixture up to a boil - the cream will be thick and will "pop" slowly. 1. Combine the cranberries, sugar, and water in a small saucepan. Heat over medium-high until the juices begin to boil. 2. Lower to a simmer and continue to cook until the berries begin to burst and the sauce starts to thicken - about 5 to 10 minutes. 3. Remove from the heat and stir in the fresh raspberries, crushing them slightly against the sides of the pot. Stir in the lemon zest. 4. Transfer to a heat-safe container and chill until cool. The compote should thicken as it cools. 1. Carefully cut off the top 1/3 of the puffs with a serrated knife and set aside. 2. Spoon in a couple teaspoons of the compote in the bottom of each puff. 3. Fill a piping bag fitted with a star tip with the pastry cream. Pipe the cream inside of the puff, and slightly out of the top. 4. Replace the tops of each puff on top of the pastry cream. Dust with confectioner's sugar, if desired. 5. Pipe a small "star" of cream on the very top of each puff and place on a single raspberry. Now that I've shared one of my big blunders in the kitchen, what are some of yours? Please let me know that I am not the only one! *This post has been sponsored by the Egg Farmers of Canada. Compensation has been provided. All thoughts and opinions are my own.